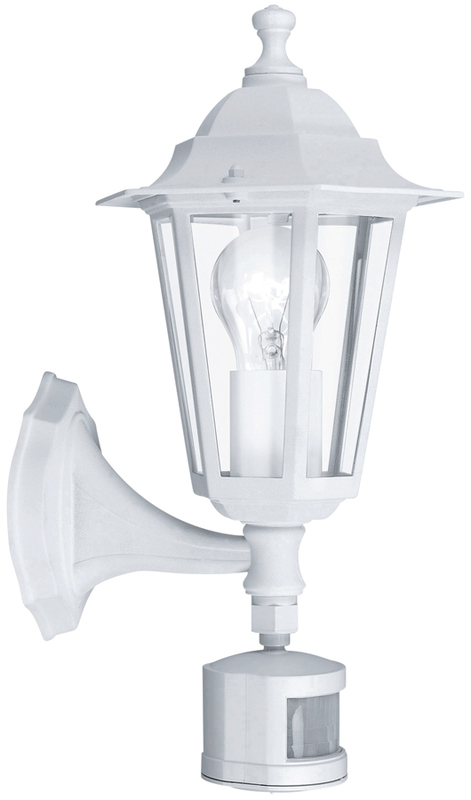 From the Laterna 5 traditional outdoor lighting range. A traditional white finish cast aluminium outdoor wall light, with an upward facing lantern and clear glass lantern panels. Built in P.I.R motion sensor is adjustable between 5 seconds and 9 minutes, with a maximum range of 8m and 120 degree field. The built in adjustable photocell ensures that the sensor only activates during the hours of darkness. Rated IP33 with a three-year finish guarantee. Can you confirm that this is pure white rather than creamy in colour please. Hello Sally. This fitting is a polar white finish and definitely not a creamy white. Kindest regards, John. Please advise if the PIR pod beneath the lamp can be turned 45 degrees clockwise. Thank you. John Caley. The PIR beneath this lantern can be adjusted to the left and right by 30 degrees in each direction. The PIR can be angled down to reduce the detection range to approximately 4m.